Aarsun Woods Provide a wide range of premium quality wooden bar cabinet. 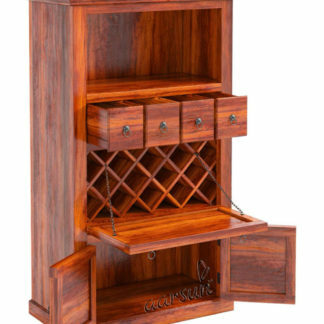 The handcrafted Wooden Bar Cabinet is made from premium quality Rose Wood. The Wooden Bar Cabinet consists of top shelf for decorative purpose and a counter shelf to mix the cocktails and 4 convenient drawers to store bar accessories. At the bottom, you will find a two door cabinet with a storage space to keep wine bottles in standing position. 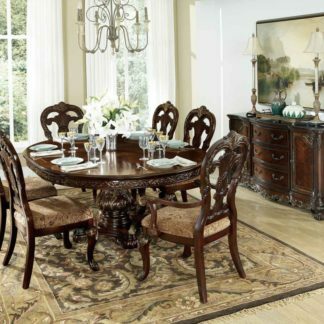 Its center comes with a one lid style panel that opens to reveal 14 wine bottles rack. At the bottom you will find a two door cabinet with a storage space for wine bottles. The 4 drawers come accented with metal loop handles for a traditional look. It’s a beautiful addition to your modern home to display your favorite’s wines. The Wooden Bar Cabinet is a perfect blend of true craftsmanship. 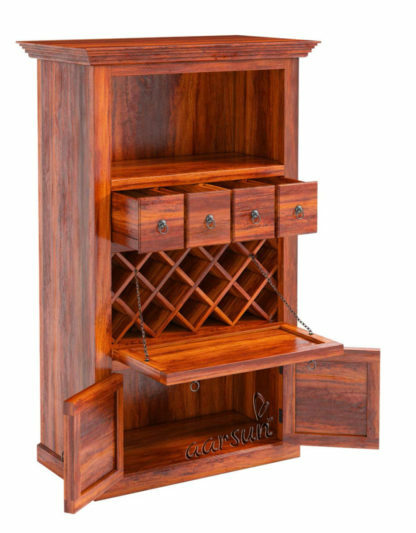 There are a number of designs available in Wooden Wine Rack, we suggest you to have a look at Wooden Bar Cabinet.